This National Bike Summit is the annual gathering of America’s cycling advocates. 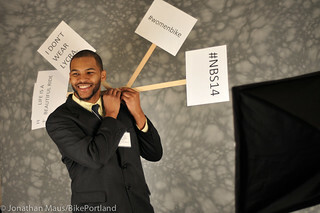 BikePortland has traveled to Washington D.C. to cover it nearly every year of our existence since 2006. Browse all our photos and stories below. Joel Maus didn’t know anyone when he came to the Summit. Now he’s got people. Disclaimer: This post is about my brother. For a movement to succeed there must be an advocacy infrastructure in place that newcomers can plug into; something that anyone with a passion and an idea can hitch themselves to and get pulled along until they become strong enough to roll on their own. For the bicycle movement, that infrastructure has been built over the last century by the League of American Bicyclists. 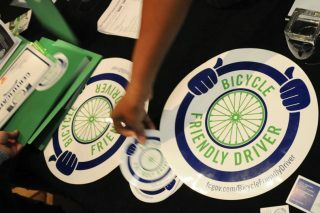 Since 2000, their annual National Bike Summit has introduced hundreds (thousands?) of newbies to the wonderful world of bike advocacy. This year Joel Maus was one of them. Bikes — and the people who love them — are making their presence felt on Capitol Hill today. 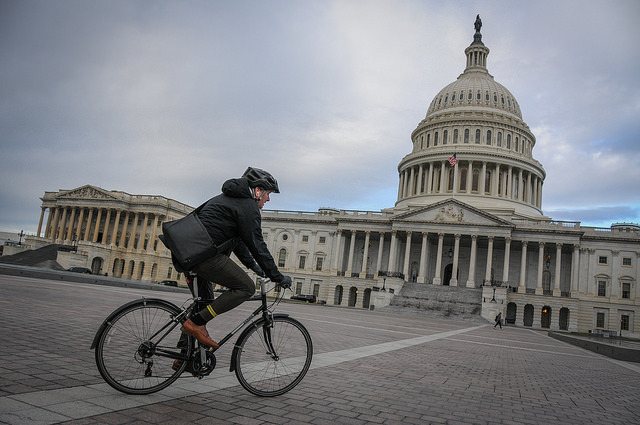 Hundreds of advocates are on Capitol Hill in Washington D.C. today to remind members of Congress that bicycling — and transportation reform in general — is a high priority for the American people. Lobby day is one of the most important elements of the League of American Bicyclists’ National Bike Summit. 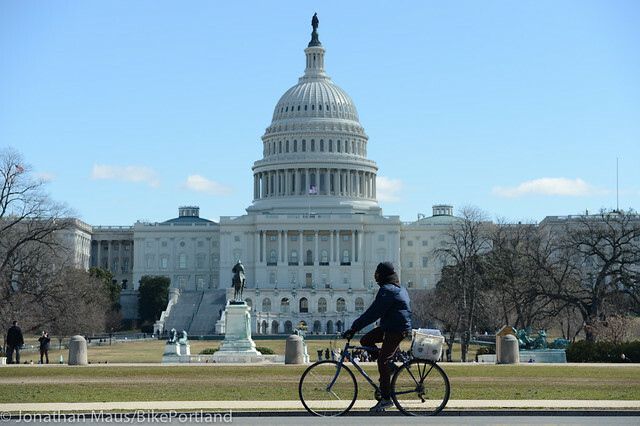 It’s a time for advocates to make a personal connection with their elected representatives, share stories about why bicycling matters, and make specific “asks” for bills and policies to support. A lot of energy gets used up on safety education in the bike advocacy world. And most of it is focused on the wrong people. That outcry led to a lightbulb moment for Jamie Gaskill-Fox, the woman who runs the Bicycle Ambassador program at the City of Fort Collins. The city was already teaching a bike safety class, but it wasn’t well attended. After that meeting, Gaskill-Fox and her colleague Scott Sampl decided to re-brand the class. 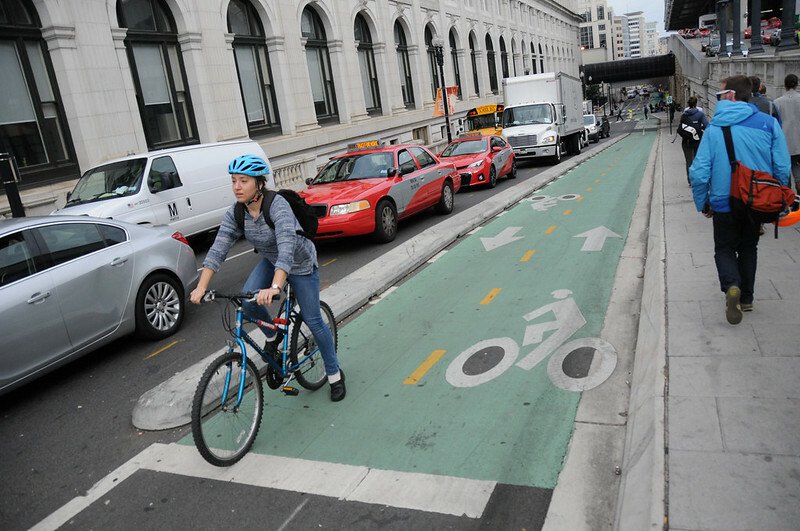 DC has started carving up their downtown streets so that bicycle users get a larger portion. If it can happen in D.C., can it happen in Portland? 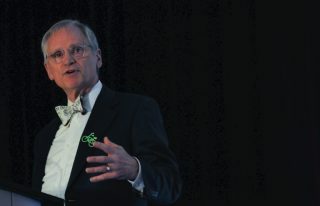 Congressman Earl Blumenauer at the Summit this morning. People who voted for Donald Trump in America’s rust belt (and other places) need to hear more about the role bicycles and cycling can play in the future of our country. And people who didn’t vote for Trump should see bike advocacy as a place to put their newfound energy for activism. Those are two takeaways from a speech by Congressman Earl Blumenauer this morning at the 17th annual National Bike Summit this morning. Blumenauer spoke about the “unprecedented levels of activism” seen in cities across America in January in response to Trump’s inauguration. Sunny — but with a few dark clouds. Day one of the 2017 National Bike Summit is in the books. After a two-year hiatus, we decided to head back to D.C. I was motivated to make the journey for several reasons. With the Trump era in full-swing, it seems like showing up for bikes in the nation’s capitol is more important than ever. Relatedly, I wanted to check the pulse of the national movement: If we do receive a major attack, will we be healthy enough to fend it off? Is it even possible to have a “we” anymore? You might want to consider showing up this year. As the reality settles in that we are just two months away all three branches of our federal government being controlled by Republicans, people who advocate for cycling need to take stock. Yes I know, cycling isn’t always a purely partisan issue, but let’s not be naïve: The fact is a large majority of powerful, high-profile Republicans tend to strongly support transportation policies that favor the use of motorized vehicles. in the lobby of this year’s Summit. 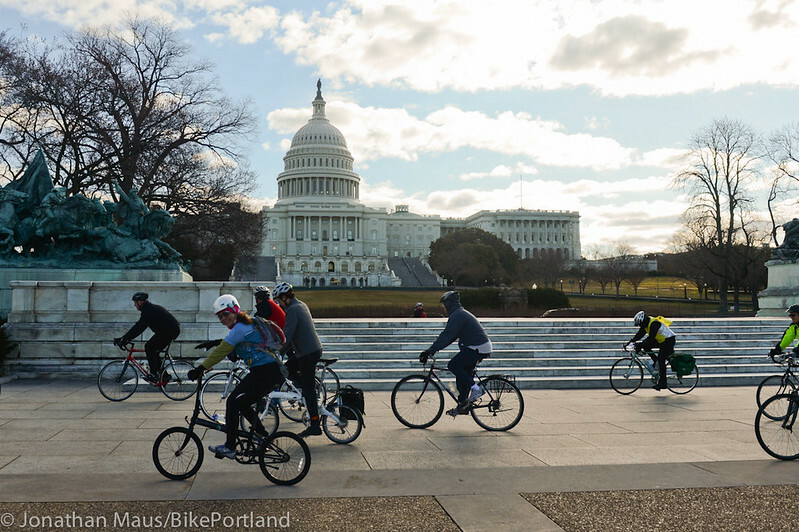 —BikePortland’s coverage from Washington D.C. is made possible by Planet Bike. 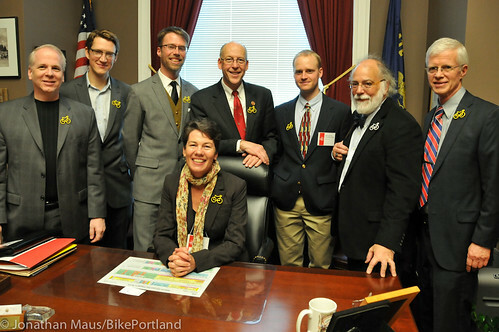 Oregon bike advocates in the Capitol Hill office of Rep. Greg Walden (R-2nd). Left to right: Blane Meier, owner of First City Cycles in Oregon City; Harry Daalgard, Travel Oregon; Brian Potwin, Commute Options, Bend; Rep. Walden; Alison Graves, executive director of Cycle Oregon (seated); Brian Jorgensen, student at Lees-McCrae College; Dr. A.J. 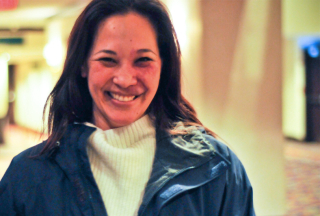 Zelada, advocate and former member of the Oregon Bicycle and Pedestrian Advisory Committee; Mike Cosgrove, gravel road riding evangelist from John Day. Oregon advocates might have the easiest job of any of the state delegations here at the National Bike Summit. No matter which of the seven offices they entered during the annual bike lobby day on Capitol Hill, they were greeted with smiles and support. There’s been a lot of talk in the hallways here at the National Bike Summit about the Women’s Cycling Forum. Started just two years ago as a single panel discussion before the Summit, it has turned into a full-day of programming with well over 400 attendees. 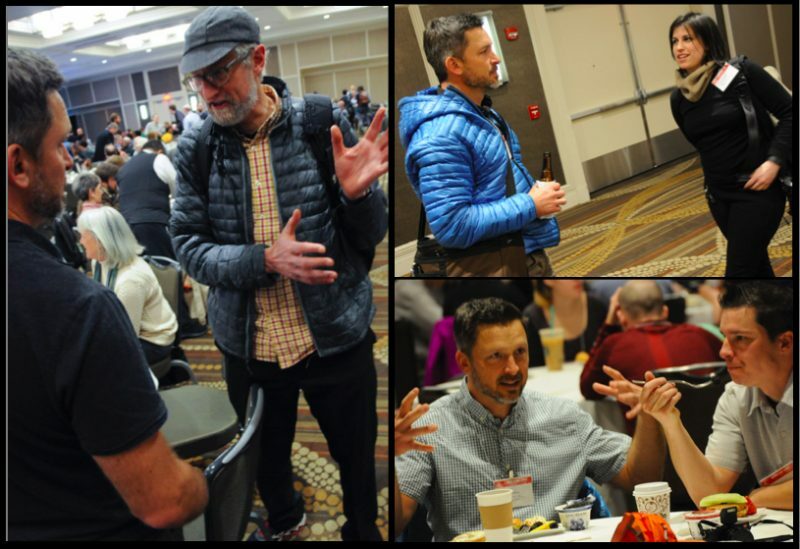 The sessions were packed, the energy was high, and its success has led to interesting conversations about how it compares with the Summit, it’s larger and more established sibling. To be clear, the Women’s Cycling Forum is a product of the League’s Women Bike program, an event to make the summit, and bike advocacy in general, more welcoming to women. It was launched in response to a growing awareness that American women don’t ride bikes nearly as much as their male counterparts. When the National Bike Summit opened Monday night (just minutes after the Women’s Forum concluded), there was a palpable change. The faces in the crowd became less diverse, a bit older in age, and much more male-dominated. And the speakers at the big dinner and evening plenary were all men. Then the next morning at the Opening Plenary the speakers were also all men. This didn’t go unnoticed by many attendees.